My wife has been making quilts ( while Im makin knives)Heres her newest, a fancy applique job . We have a Blue jean quilt thats rather awsome too, you know your covered when you pull it over you, thing weighs a ton . 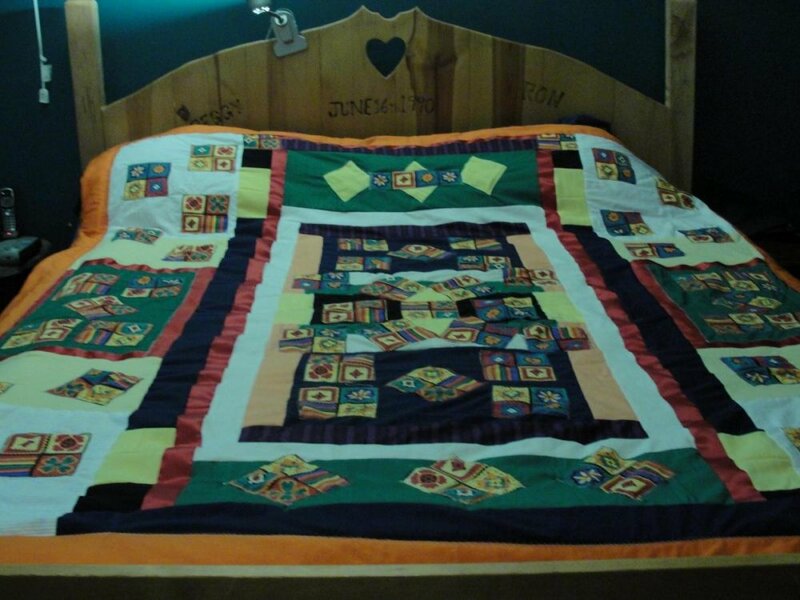 Any of you folks in the cold north need a good quilt, Simple Jobe quilts ( plain large patchwork) are $60.00 , a fancy one like in this pic is $100.00 . She Can do your pattern and color scheme. Thanks for lookin stay warm now! That is beautiful work, and way too cheap! I know whereof I speak, my first wife was a quilter. I lived for years working my away around a quilting frame in the living room, sometimes two! "What's that dear? Your fingers hurt?... Well now your back's gonna hurt... cuz you just pulled landscaping duty..."
Seriously tho... beautiful work... and I'm with Geoff.... waaaay too cheap. People around my area pay double those prices for similar work. kinda diggin the headboard too!! Bill... when my wife says make the bed I say "I did"! 15 years ago our water bed died, I coulnt afford a bed , but then I saw my neighbors throwing out a king size matress and box . I built the bed to use the thown away mattress! Posts are stacking cribs that steel plate is shipped on. Head board is just pine 1x10s. Interests:Knife making , customizing and shooting pistols and rifles forging outside the box Guarding veggies, Farming , old school ways , home schooling . Very Cool and as others stated Very cheep even for here in Tennessee where folks still make them just as y'all do that would be round 250 to 300 and higher if 100 % done by hand as folks now days tend to machine stitch the batten and bottoms together . It's machined stitched Sam, wife has fibro........ no hand stitching! It is still a fine quilt brother Ron. My wife said still to cheap!!! This is Ron's wife. Thanks for the kind words, guys! It is a Beautiful Quilt and I agree Kip still cheap However when I was in the Sand Box in the East I got one sown by a few ladies and really enjoyed it as it did/does get in the low 20's many times at night over there.